This report describes the use of inverted internal limiting membrane (ILM) flap technique as a treatment option for traumatic macular holes (MHs) with severe macular pathology. An interventional case series of two patients who experienced blunt trauma is reported. One patient developed two adjacent MHs and the second patient a MH with focal tissue avulsion in the fovea. Each patient underwent pars plana vitrectomy with ILM flap creation and intraocular gas tamponade. The ILM flap technique was successfully used for closure of MHs in one patient with a traumatic double MH and another patient with MH with foveal tissue avulsion. Visual acuity and symptoms improved in both patients. The ILM flap technique is a useful option for patients even with advanced pathologic findings subsequent to traumatic MH formation. Macular hole (MH) is a full-thickness defect in the foveal center first described in 1869 by Knapp in a case of ophthalmic trauma and can result in loss of central visual acuity (VA), visual distortion, and central visual scotoma.1 Traumatic macular hole (TMH) is more common in young adults whose posterior hyaloid is still attached and this has been attributed to vitreous tractional forces.2 Spontaneous hole closure has been reported with rates ranging from 10%3 to 67%, with closure occurring usually in the first 6 months.4 Nevertheless, large MHs (diameter exceeding 400 μm) have demonstrated lower postoperative closure rates with up to 44% of them remaining open after surgery.5 Herein, we report two cases of traumatic MH with severe preoperative macular pathology that were successfully treated with the inverted internal limiting membrane (ILM) flap technique. Patient one was a 39-year-old female presenting 3 days after receiving blunt trauma to her right eye from a stray baseball hit into the stands at a professional baseball game. Her vision was count fingers in the affected eye with normal intraocular pressure (IOP), no afferent pupillary defect, and no motility limitations. Her examination showed facial findings consistent with the trauma. The anterior segment was notable for 2+ cell, mild nuclear sclerosis, and vitreous hemorrhage obscuring the fundus with subretinal and sub-retinal pigmented epithelial (RPE) hemorrhage (Figure 1a). 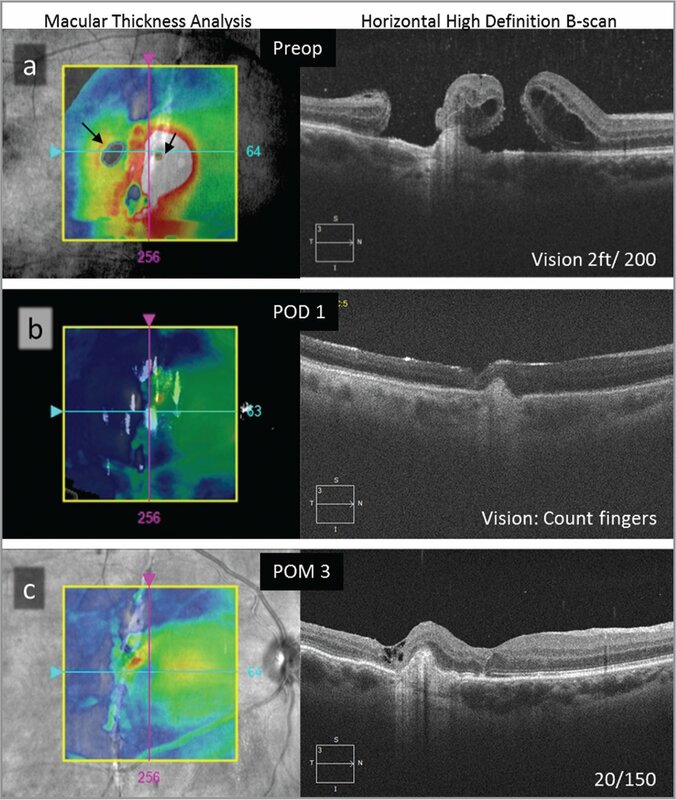 Optical coherence tomography (OCT) demonstrated macular detachment with a possible full-thickness macular hole (FTMH) (Figure 1b) and B-scan ultrasonography confirmed mobile vitreous opacities with elevated clumped opacities in the macular measuring 1.6 mm tall but without rhegmatogenous retinal detachment (Figure 1c). The patient was managed conservatively with close observation. (a) Fundus photo with vitreous, subretinal, and subretinal pigmented epithelial hemorrhage. (b) Optical coherence tomography demonstrates macular detachment with a possible full-thickness macular hole. (c) B-scan ultrasonography displaying mobile vitreous opacities with elevated clumped opacities in the macular but without rhegmatogenous retinal detachment. Four months after injury, the vitreous hemorrhage had resolved revealing two FTMHs with one involving the fovea and the second temporal to it, overlying a choroidal rupture site (Figure 2a). The patient underwent 23-gauge pars plana vitrectomy (PPV) with indocyanine green (ICG) staining of the ILM, macular ILM peeling with preservation of a temporal ILM flap (Figure 3a), air-fluid exchange, and insuflation with C3F8 gas (see Supplemental Video below). The ILM flap was constructed to be a sufficient size and on the temporal edge of the temporal eccentric MH so that during air-fluid exchange at the optic nerve head, fluidics of fluid removal would carry and position the flap over both MHs (Figure 3b). The patient was kept face-down for 1 week. On postoperative day 1, the hole was closed by OCT under C3F8 (Figure 2b) and by 3 months after surgery, both MHs remained closed and the patient refracted to a vision of 20/150 (Figure 2c). (a) Preoperative optical coherence tomography (OCT) demonstrates two macular holes overlying a choroidal rupture. (b) OCT under C3F8 on postop day 1. (c) Optical coherence tomography 3 months after surgery. (a, b) Fundus photo and schematic drawing of the internal limiting membrane flap before and after correct placement. The second patient was a 22-year-old male presenting 1 year after a motor vehicle accident with deployment of airbag that hit his left eye. He noted a gradual decline in VA during the course of the year since the trauma. The patient's vision was 20/250 in the left eye on presentation with normal IOP and normal anterior segment exam. Fundus exam revealed a pigmented macular scar with traumatic MH and vascular sheathing. OCT demonstrated dense vitreous condensation overlying a FTMH and a pigmented epithelial detachment. Over time, the vision continued to decline to 20/500 (Figure 4). The patient underwent PPV with a large temporal ILM flap with placement assisted by intraoperative OCT, and C3F8 gas tamponade. Postoperative evaluation at 4 months demonstrated closure of the traumatic MH with a modest improvement in VA to 20/400. (a) Fundus photo and optical coherence tomography (OCT) displaying full-thickness macular hole and pigmented epithelial detachment pre-surgery. (b) Fundus photo and OCT showing hole closure 4 months after surgery. This report demonstrates two cases of FTMH with severe retinal pathology: double MH and MH with avulsed foveal tissue. In both cases, the ILM flap technique was employed and hole closure with improved VA was achieved. A drawback of this report is its retrospective nature and lack of a control group of patients strictly undergoing vitrectomy with ILM removal without a flap applied to the hole. Even though our results point to an effective treatment option, future randomized trials might better evaluate whether PPV with and without ILM flap technique would improve the treatment of patients with traumatic MHs. Knapp HV. Ueber isolirte zerreissungen der aderhaut in folge von traumen auf dem augapfel. Arch Augenheilkd. 1869;1:6–29. From Cole Eye Institute, Cleveland Clinic Foundation, Cleveland. Dr. Kaiser has received personal fees from Alcon outside the submitted work. Dr. Singh reports grants and personal fees from Regeneron and Genentech; personal fees from Shire; and grants from Apellis and Alcon during the conduct of the study. The remaining authors report no relevant financial disclosures. Address correspondence to Rishi P. Singh, MD, Cole Eye Institute, Cleveland Clinic Foundation, 9500 Euclid Avenue, i32, Cleveland, OH 44195; email: singhr@ccf.org.